If you are adding a new extension to your home then hopefully it will be everything you dreamt of: plenty of light and space, a smart kitchen, the latest gadgets, mood lighting and a comfy family sitting area. However, have you considered the impact your ‘old’ garden will have in your new space? It is well worth thinking about this as early as you can. Now your beautiful bi-folding sliding doors present you with a generous view of your old garden! Your old garden may be out of harmony with your new home. It will need at least a few new pieces to bring it up to date with your stylish extension. 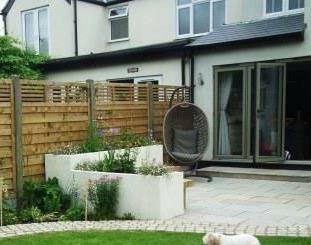 When planning your extension, it may be worth thinking about garden access. If you are planning a full width extension, I advise planning your garden and getting any hard landscaping done before access is lost. This will save you a great deal on labour later. You will very likely need a new focal point to draw your eye to, perhaps taking attention away from unsightly views or dishevelled features such as old sheds or fencing falling apart. A small tree or a nicely placed, planted border will do the trick. If you want something more architectural, try placing an urn or a bench framed by planters. Consider carefully where to place your new deck or patio. Don’t immediately assume it should go at the back of the house, straight outside the garden doors. Find out where the sun will be in your garden at the time you will be eating outdoors: that is where your dining area should go. Don’t make the widespread mistake of placing a table and chairs in the garden by your sliding doors,It’s neither practical nor aesthetically pleasing. It is much better to have a sitting area for sofas and armchairs one side of the doors and a dining area the other. What also looks great is to have a gorgeous planted border directly in front of the new glazed areas to feast your eyes on from your cosy inside, come rain or shine. Consult with your architect or garden designer about how the transition between indoors and outdoors will be resolved.Most people these days want a perfectly flush finish between indoor and outdoor floor level but this is not always possible for technical reasons. The exterior level should not breach the damp proof course of the house; this typically means a patio should be 150mm below the DPC or airbricks. Otherwise damp can get into the structure of the building. This is a case where style shouldn’t prevail over substance. If your extension faces South or West, it is likely to get very hot. To keep it at a pleasant temperature, you can have specially treated glass that reflects the sunrays away, or you could have some kind of window treatment: sheer curtains, shutters, etc. Alternatively, you could address it from the outside: with an awning, a pergola clothed with deciduous climbers or a well-placed tree. Make sure you choose deciduous varieties: they will filter the sunlight in the growing season but allow it to come through in winter. Lighting: Placing a few subtle lights in the garden, perhaps up-lighting a few shrubs or a particularly nice tree, will incorporate the view of the garden into your interior space at night, making it feel bigger. But make sure you also light something immediately outside the house or otherwise you will just get the reflection from your interior lights bouncing off the glass, turning the exterior into a black hole. Your old path may be in a nonsensical place, leading from the now defunct old back door. New paths leading you to the new seating areas you have created with give the garden a journey that makes sense. Employ a professional, ideally an SGD accredited, Garden Designer to help you through.Having spent all that money on your extension, why not invest a little on your outdoor space? A garden will mature and become more beautiful over time, giving you pleasure for years to come.